Poori masala recipe – South Indian style potato masala made with boiled, crumbled potatoes in mild, flavorful gravy. It is served with hot, puffed pooris. In this potato masala gravy, green chili is the only ingredient which gives the heat. So adjust it accordingly. I have used only one green chili which gives mild-to-medium spicy taste. Any potato side with pooris is the best combination. At home, we love this kind of meal once in awhile. Hence you will find few versions here. For sure, this poori masala is indulging meal with full of carbs. Traditionally, it is served as a breakfast. But in modern lifestyle, We are not eating this kind of heavy breakfast. I always make it as a weekend meal. This poori masala or any potato dish with puri is always heavy on stomach. Once you have it as a meal, you don’t feel like doing anything. So weekend is the perfect time to make it. Instead of serving with pooris, it can be served with roti or paratha. It can be served as a side with dosa too. 1) First boil the potatoes. Take washed potatoes in a pressure cooker. add enough water so potatoes are submerged in the water. Close the lid of pressure cooker and put the weight on. Let it cook for 2-3 whistles on medium heat. Number of whistles or cooking time may vary depend on the size of the potato. 2) Let the pressure go down by itself then open the lid, remove boiled potatoes and let it cool to touch or warm. 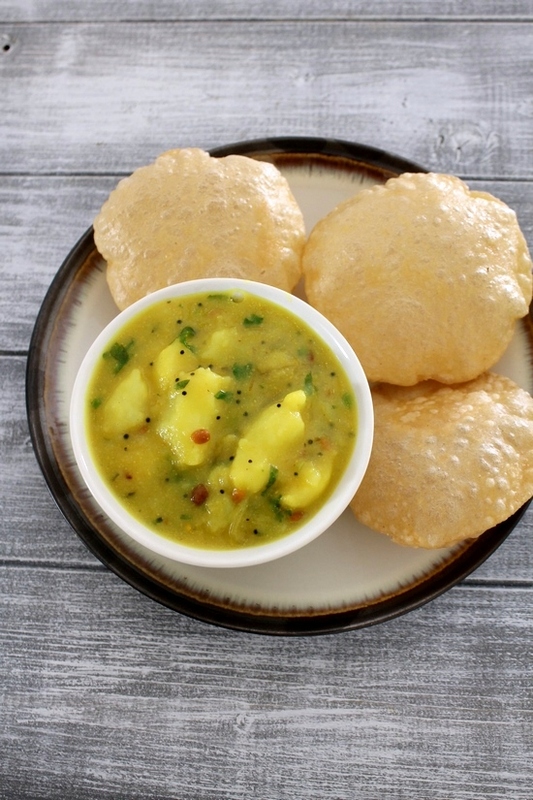 3) While potatoes are cooling, knead the dough for poori. Also take besan in a small bowl, make smooth paste by using 2 tablespoons of water. keep it aside till needed. 4) Now potatoes are warm and cool enough to handle. peel the potatoes. 5) By using your hand, crumble them roughly. 6) Some are chunky while some has been mashed. Mashed one helps to thicken the gravy and big chunks add the texture. 7) Heat the oil in a pan on medium-low heat. Once hot add mustard seeds. Let them pop. 8) Then add chana dal. 9) Saute the dal till they are light brown in color. Do stir constantly so it gets browned evenly. 10) Then add urad dal. 11) Do the same, saute with stirring constantly till they are light brown in color. Make sure they do not get burn. 12) Now add curry leaves and green chilies. Saute for a minute. 14) Immediately add sliced onions, Add salt to speed up the process. 15) Cook till onions get soft and cooked. 17) Then add prepared besan mixture. Do stir before adding, as besan may settled down at the bottom. 19) Bring it to a boil and let it simmer for 5 minutes. 20) Then add crumbled potatoes. 21) Mix well and let it simmer for again 4-5 minutes. 22) By this time gravy has thickened nicely. If needed you can add more water if gravy is too thick. Turn off the stove. 23) Lastly add chopped cilantro and squeeze lemon juice. 24) Mix well and it is ready to serve. Right before serving, start making poori. 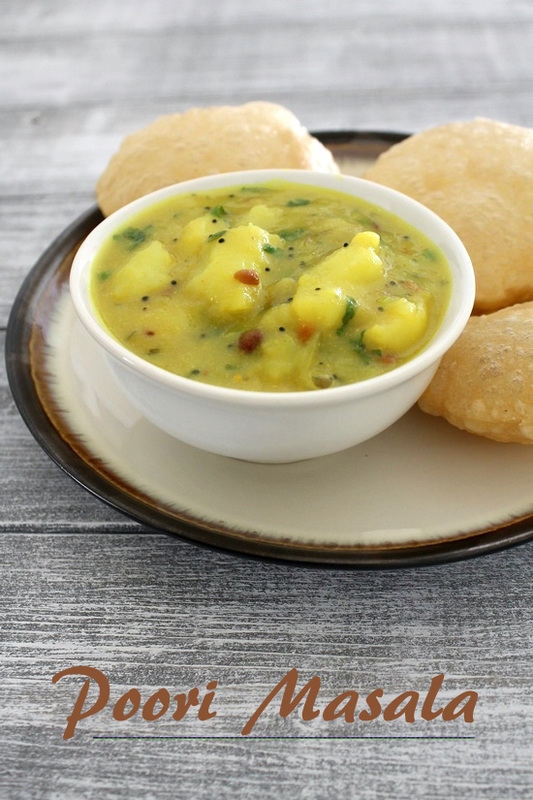 Serve hot poori with warm potato masala. Serving suggestions: Serve poori masala as breakfast. For many including me, this is heavy breakfast. It can be served as meal. Instead of poori, you can serve potato masala with paratha or roti or dosa. First boil the potatoes. Take washed potatoes in a pressure cooker. add enough water so potatoes are submerged in the water. Close the lid of pressure cooker and put the weight on. Let it cook for 2-3 whistles on medium heat. Let the pressure go down by itself then open the lid, remove boiled potatoes and let it cool to touch or warm. Now potatoes are warm and cool enough to handle. peel the potatoes. By using your hand, crumble them roughly. Take besan in a small bowl, make smooth paste by using 2 tablespoons of water. keep it aside till needed. take atta, salt and 2 teaspoons of oil in a bowl. Mix using fingertips well. Start adding little water at a time and knead into smooth yet stiff dough. Cover and let it rest for 15-20 minutes. Heat the oil in a pan on medium-low heat. Once hot add mustard seeds. Let them pop. Then add chana dal. Saute the dal till they are light brown in color. Do stir constantly so it gets browned evenly. Then add urad dal. Do the same, saute with stirring constantly till they are light brown in color. Now add curry leaves and green chilies. Saute for a minute. Add turmeric powder. Immediately add sliced onions and salt. Cook till onions get soft and cooked. Then add prepared besan mixture. Stir well. Bring it to a boil and let it simmer for 5 minutes. Then add crumbled potatoes. Mix well and let it simmer for again 4-5 minutes. Lastly add chopped cilantro and squeeze lemon juice. Mix well. After resting time knead the dough once again to smooth out. Divide the dough into 24 equal sized portions, Make smooth ball out of it. Now using rolling pin and rolling board, make 2-3 inch diameter circle. Roll few pooris and keep them in a plate, also keep them covered with kitchen napkin. Heat the oil in a pan on medium heat. Once hot slice one poori into hot oil. By very gentle pressing using back of slotted spatula fry them. It will help poori to puff up. Then flip it. Fry the other side until it is light golden brown in color. Remove it from the oil using slotted spoon and place on paper towel lined plate. The south Indian also looks like the aloo puri of Aligarh (UP) where I grew up. It is to die for. 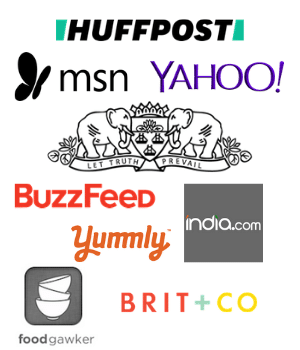 Can you find a recipe? Sure, I will make that and share here as time permits.